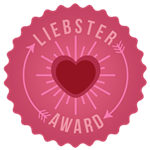 Thank you Katie Corley of Life in the Simple Lane for nominating me for the Liebster Award! "Liebster" is a German word meaning sweetest, kindest, nicest, dearest, beloved, lovely, kind, pleasant, valued, cute, endearing, or welcome. The Liebster Award is granted to new, up and coming bloggers with great potential and fewer than 200 followers. According to the rules of the Liebster Award, I am to answer 11 questions posed at the nominating website, choose 11 people to whom I will pass on this honor, and then make up 11 more questions which the new recipients must then in turn answer. What is your favorite dessert? Chocolate chip cookies . . . and brownies . . . and Reese's Peanut butter cups . . . really, I've never met a desert I didn't like! Can you touch your tongue to your nose? Nope. I'm a big fan of British television. I'm a Trekkie and a Whovian. I don't own a smart phone. I love chocolate and peanut butter. I don't like cheese on my hamburgers. I like veggies on my pizza. I don't have any pets, but wish I did. My favorite movies are period movies with gorgeous costumes. I have always wanted to own a bee box. 3. What TV shows do you watch? 4. What kind of phone do you have? 5. What is your favorite desert? 6. What are your favorite pizza toppings? 7. Do you have a favorite movie? 10. Who is your favorite actor / actress? 11. What is one thing you've always wanted to do? 1. Thank your nominator and link back to the nominator's blog in your post. 2. Answer the 11 questions posted by the nominator. 3. List 11 random facts about yourself. 5. Nominate 11 other fabulous up and coming blogs with less than 200 followers for the Liebster Blog Award. What a cool thing! Congrats on your nomination! I found you via Parlo & Logi, and am your newest follower!